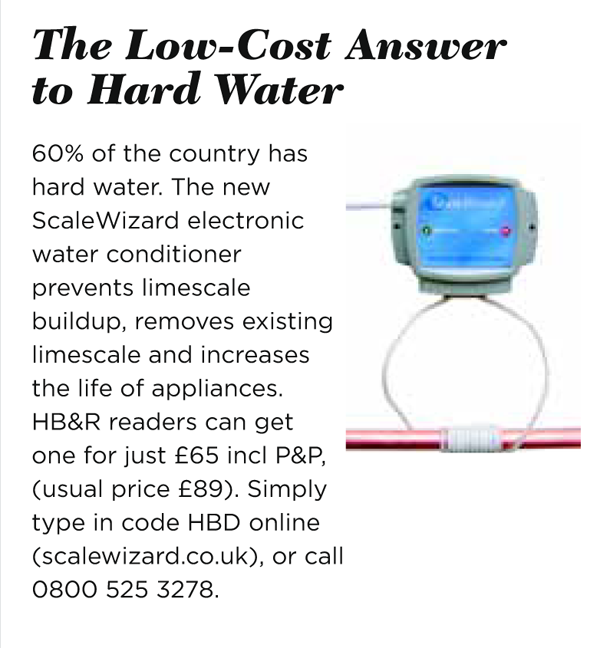 The Scalewizard is the simple solution to limescale removal in hard water areas. If you live in a hard water area you'll know the cleaning and hygiene problems that can be caused by hard to remove unsightly white limescale deposits that you find around taps, basins, toilet bowls, baths and shower areas, and what about the hidden costs? Hard water problems are experienced by the majority of households throughout the UK. Left without removal and further preventative treatment, limescale build ups can result in increased fuel and maintenance bills. Water softeners are one solution but these treatments are expensive and require plumbing and incur ongoing salt and maintenance costs. Using electronic technology, the Scale Wizard contributes to the elimination of limescale problems without changing the mineral content of the water and once fitted it can save hours of cleaning time! Best of all, this innovative solution will begin to save you money from day one, reducing existing scale and giving longer life to domestic appliances, not forgetting the savings on fuel bills, soaps, shampoo's and detergents. Scalewizard is sold as a one size fits all pipe sizes up to 1" and works on plastic, copper, galvanized steel and lead. Scalewizard provides an insurance policy for your domestic water system. Although your boiler may have a service agreement many of these service agreements don't cover damage caused by limescale. Scalewizard is preventative maintenance and installing a unit can save you future problems. Don't wait until you've paid an expensive call out charge to a plumber - Install the scalewizard now and prevent limescale build ups. Scalewizard will reduce existing limescale in your water systems. When is the best time to fit a ScaleWizard ? RIGHT NOW is the best time! We were featured in Homebuilding and Renovating magazine. Click here to read more.